It was another stunning day in Kaikōura for our final day of the field trip. We had more places to be and people to see. It sure has been a busy week! Our day started at Te Hā o Māturanga. This place is all about encouraging learning in Kaikōura. Here we met Rachel Vaughan, who leads the All Right? campaign for Kaikōura. Rachel was our expert for the web conference. Emma Duncan also joined us as an expert – two experts for the price of one! 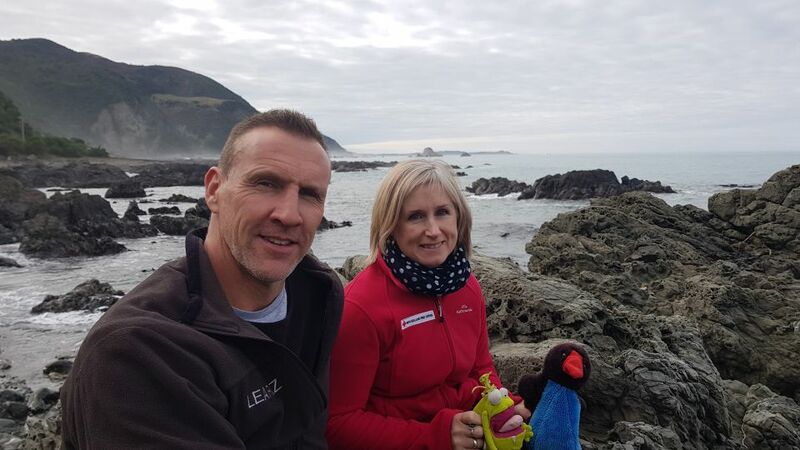 It was great having two experts for this web conference because we were able to get an idea of earthquake recovery from the point of view of someone in Kaikōura (Rachel), as well as someone in the rural town of Waiau (Emma). I encourage you to listen to a recording of the web conference if you missed the live one. Thanks to our speaking school today – Bream Bay College. Thanks also to those of you who joined as listening schools. Some of you have been with us all week – you’ve been great company! After the web conference we chatted some more with Rachel at Te Hā o Mātauranga. We discussed the idea of topping up the wellness bank following an emergency event. We also talked about the five ways to wellbeing and the importance of community when adapting after an emergency. You can read more about these five ways in the background reading page Supercharge Your Wellbeing. 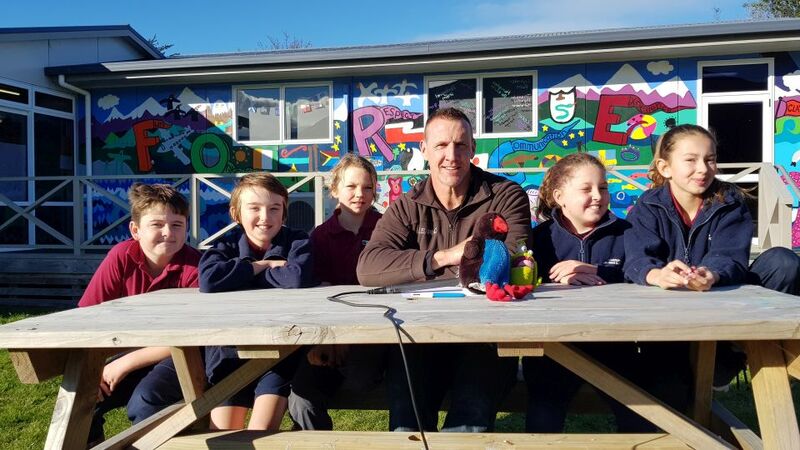 From Te Hā o Mātauranga, we made our way to Kaikōura Suburban School. We met the principal, Hayden van Lent, and some of the students. It was great talking with Hayden and the kids about their experiences from the earthquake. The students had some interesting stories to tell which you can find out more about in the video. Some of the students were new to the area. They moved here with family who are now working for NCTIR on the road rebuild. We talked with Hayden about how important a school can be for the community during times of emergency. When I asked him how they have moved forward after the event, he said that it was important they focussed on the school values. I think this is a good lesson for all schools. It might be a good idea to discuss your own school values as a class and work out how they could help you to get through similar circumstances. It was soon time to ‘hit the road’, as they say. The ambassadors and I are spending our last night of the field trip in Christchurch before flying back to Kerikeri tomorrow. On the way south, we stopped to have a chat with Jill Short. Jill is the Recovery Coordinator for New Zealand Red Cross. She has also helped organise this field trip, including all the people we have met along the way. I discussed with Jill some of the key ideas from the field trip this week. Of course, it has all been about adapting after an emergency. For me, I have realised how people and a community, as well as organisations like New Zealand Red Cross, play such a vital role in helping people to adapt. When you watch the video, you might like to think of and discuss key ideas you have about adapting after an emergency. 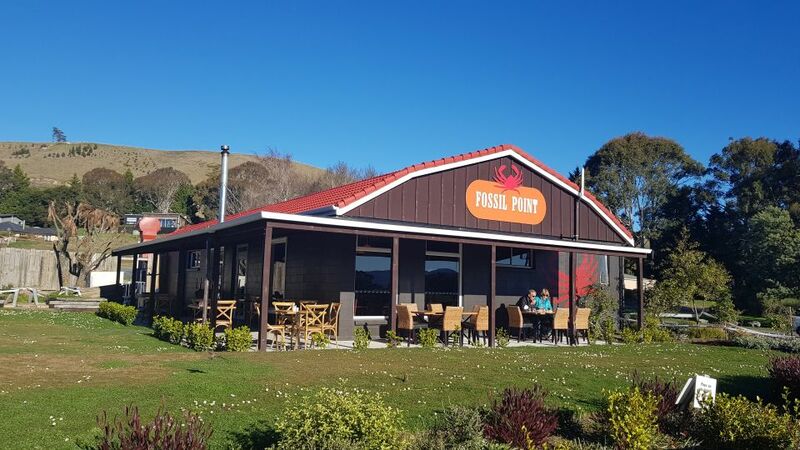 Our final stop before Christchurch was Fossil Point Café in Greta Valley. Kim Henderson and her husband opened the café just a few months before the November 2016 earthquake. Road closures from the earthquake meant fewer customers for the café. Kim says it was a very frustrating and stressful time. As an artist, Kim used her skills to express this frustration. It was like an outlet for her stress. This reminded me of the five ways to wellbeing. Perhaps it should be the sixth way to wellbeing – get creative/auahatanga. Kim is a ceramic artist but during this time she took to cartoon sketching and word play to express her feelings. It was good therapy and helped her to get through some difficult times. There is still some work to do but with improvements to the road and increasing traffic, things are finally looking up for Fossil Point Café. There is an image of one of Kim’s sketches on today’s diary page, and you can see more in the video. Kaikōura to Fossil Point Cafe. I was in Christchurch City when the February 22, 2011 earthquake hit. It was a scary time indeed. Luckily for me, our house was undamaged, the power and water stayed on, and I was able to work from home. We were also able to eventually move back to the North Island and be closer to family. But as you have seen this week, emergencies such as an earthquake can have wide ranging impacts on people’s lives. What I have learned is that people are your biggest asset in times of need. It also pays to keep yourself well, so you are better able to cope should an emergency happen. Remember too that you are not alone. There are support networks in your community. This includes agencies like New Zealand Red Cross/Rīpeka Whero Aotearoa. Stay safe, stay well, and I’ll see you on another field trip soon! 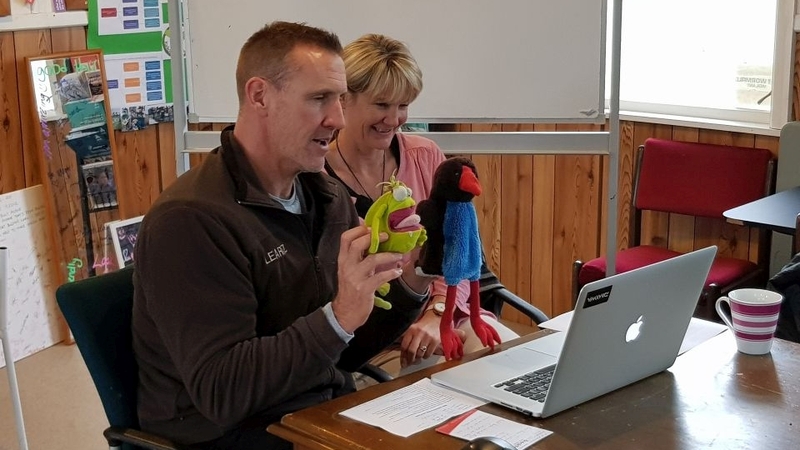 Andrew and the ambassadors with Rachel Vaughan on this morning's web conference at Te Hā o Mātauranga. Image: LEARNZ. 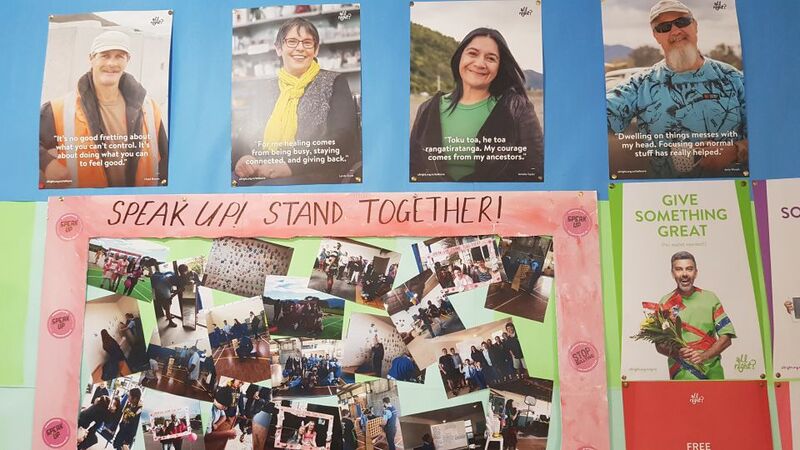 Positivity was very present at Te Hā o Mātauranga. At the top of this picture you can see some posters from the All Right? Kaikōura campaign. Image: LEARNZ. Andrew and the ambassadors with students from Kaikōura Suburban School. What has been the reason for new students joining the school recently? Image: LEARNZ. 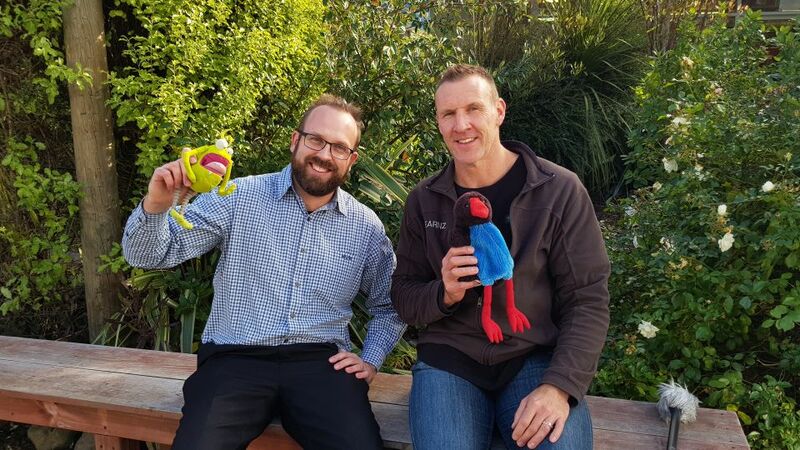 Andrew and the ambassadors with principal of Kaikōura Suburban School, Hayden Van Lent. What has been helpful for the school as it works to recover from the earthquake? Image: LEARNZ. 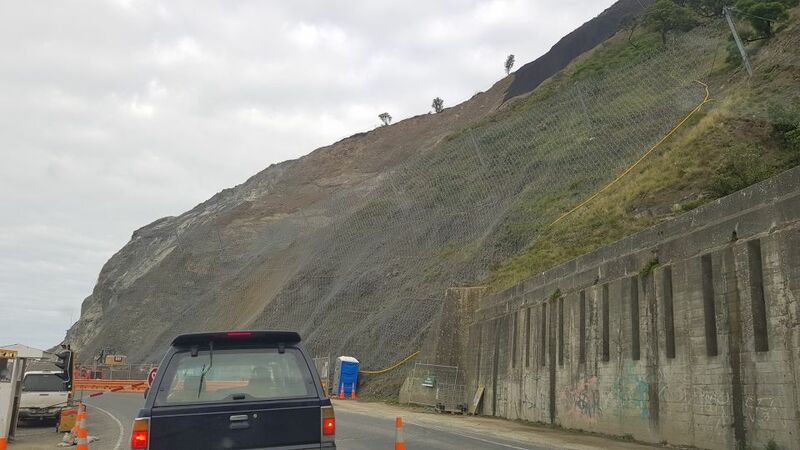 Steel mesh wrapped around a slip on State Highway 1 south of Kaikōura. Image: LEARNZ. Andrew and the ambassadors with Jill Short from New Zealand Red Cross/Rīpeka Whero Aotearoa. You can see the Kaikōura Peninsula in the background. Image: LEARNZ. 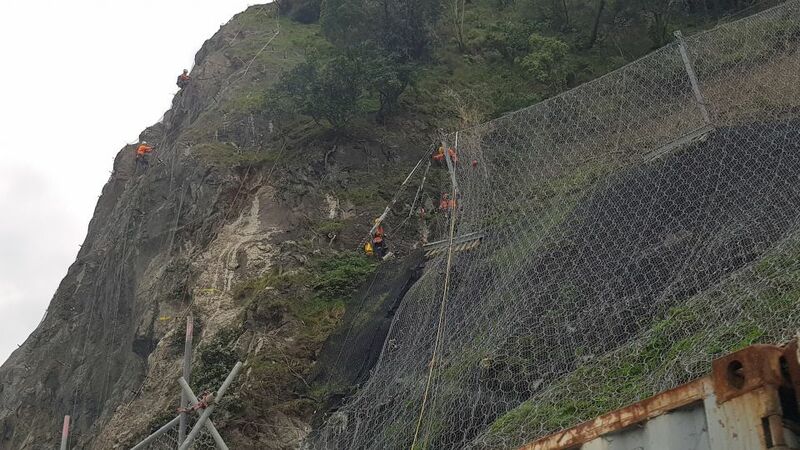 Here you can see people working on more steel mesh to secure slips south of Kaikōura. How are these workers able to get onto this slip face? Image: LEARNZ. Fossil Point Cafe in Greta Valley. How was the cafe affected after the earthquake? Image: LEARNZ. 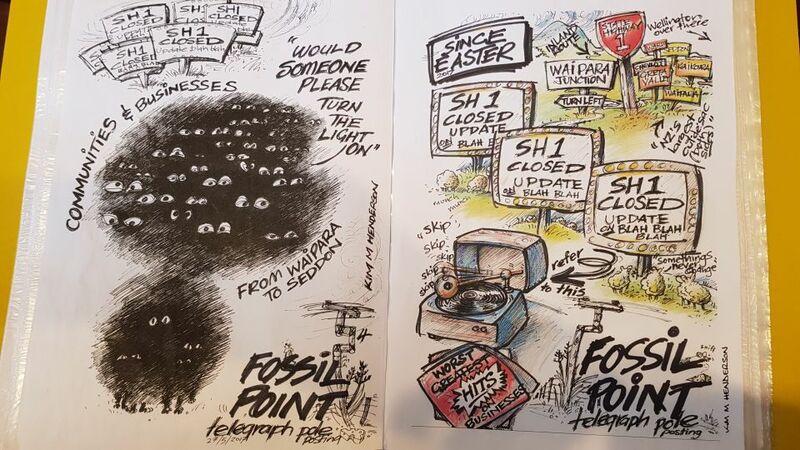 A couple of Kim Henderson's sketches. How has art helped Kim after the earthquake? Image: LEARNZ. 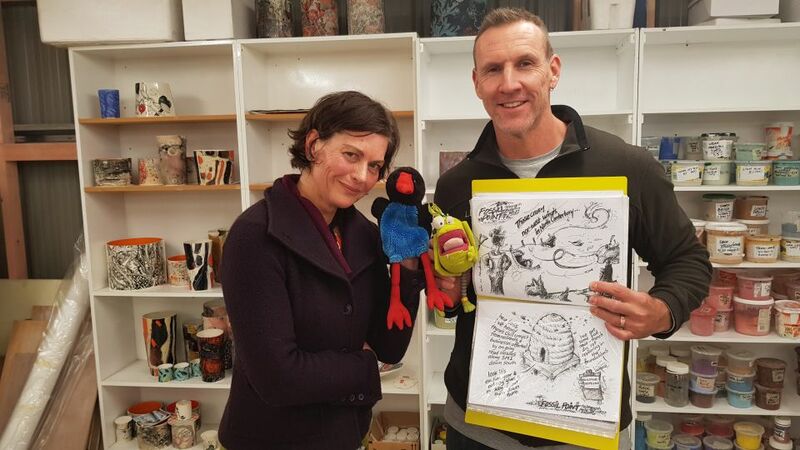 Andrew and the ambassadors with Kim Henderson in her ceramic studio. Image: LEARNZ.